Born: 1980 My recent paintings are a reconciliation between past and present, particularly in regard to Western cultures notions of spirituality and the relationship between society and nature. Drawing from a variety of contemporary and historical sources, from the Renaissance to modern cinema, literature and popular culture, the paintings are an attempt to come to terms with the present through the immediate marriage of todays visual culture with that of the past. 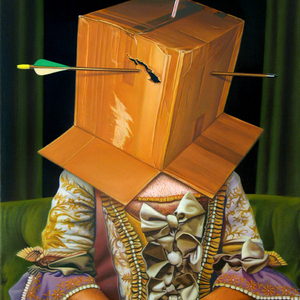 Both theatrical and satirical, comical and somber, the paintings pose a view of humanity that is steeped in the existential turmoil that lies between materiality and spirituality, where society trudges persistently forward into the future while the human search for meaning and purpose as mortal animals remains unresolved. Having its roots in the Renaissance and manifesting itself in all manner of contemporary media, the notion of the rectangle as a window into an alternate reality has become an inherent mode of viewing in human culture. Whether via canvas, computer or television screen, there exists an eager willingness to suspend one's disbelief and subscribe to the illusion of simulated space depicted on a two-dimensional surface. In my work, this notion of the rectangle as window is utilized to present fragments of narratives that are imbued with a degree of reality while also recognizing themselves as fictional constructs. Consisting of familiar archetypes from historical painting to contemporary popular culture, these narratives seek to draw focus on the grotesqueness, beauty, comedy, and horror that lie just beneath the surface of the ordinary. In this way, the rectangle is not only a window but also a kind of fun-house mirror that reflects an image of the real world while distorting it into something otherworldly. The images themselves come from many different places. Some are calculated references to art history or contemporary culture and others are the result of free association, improvisation or imaginative flights of fancy. Some paintings aspire towards coherent satire or self-reflexive commentary on the nature of painting while others use history and current events as a loose foundation for constructing open-ended narratives. Some paintings are simply imaginative explorations executed for the sake of satisfying my own curiosity. In any case, central to each painting is a particular worldview that seeks to balance tragedy with comedy, beauty with ugliness, and rationality with uncertainty.